Serena Williams holds her trophy after winning the women's singles final at the 2017 Australian Open. 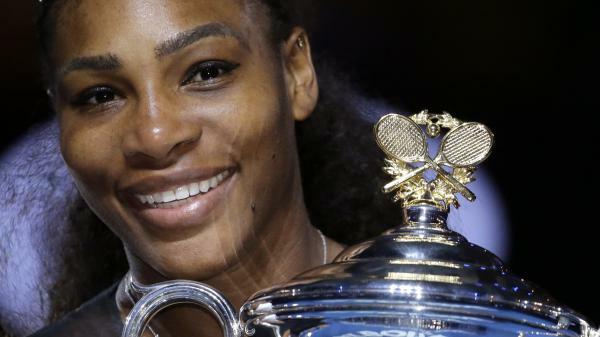 Tennis queen Serena Williams is serious about trying new things this year. In addition to becoming engaged and being pregnant, La Serena has taken on the challenge of helping to diversify Silicon Valley — a task that might be hardest of all. Williams has joined the board of SurveyMonkey. The privately-held survey company was headed by Dave Goldberg, who died suddenly in 2015. His widow, Sheryl Sandberg (COO of Facebook) and Williams are good friends. Looks like Williams will be leaning in at SurveyMonkey to work on diversifying that company, and maybe by her presence, encouraging other tech boards to think differently. (Maybe it's a trend? Apple just announced Denise Young Smith, former head of Apple's global HR, has been promoted to VP of its diversity and inclusion efforts.) Oh, and don't expect Williams' Silicon Valley presence to be a drive-by: she'll likely be spending more time there, since her fiancé is Reddit co-founder Alexis Ohanian. Reverse migration? Chicagoans are leaving in such numbers that the Windy City has become the first in the top 15 of the country's biggest cities to lose population. The Chicago Tribune reports that black residents are leaving "in search of safe neighborhoods and prosperity, with many heading to the suburbs and warm-weather states." The dwindling population was initially stabilized by Mexican immigrants. But in 2007, the paper says, "Mexican-born populations began to fall across the nation's major metropolitan areas." Chicago's shrinking population is part of the general downturn in population numbers in the Midwest. Although the worldwide refugee crisis continues unabated, the number of refugees accepted into the United States has plummeted. The Dallas Morning News reports on a new Pew Research Center study that says Texas used to be one of the top states in terms of taking in refugees. Under the Trump initiative to halve the number of refugees the U.S. accepts, refugee resettlement in the Lone Star state dropped 70 percent between October 2016 and April of this year. Pew says refugee intake has dropped across the country. More customized headgear for Latino graduates: when a thank-you card for Mami and Papi isn't enough. Better late than never: Jesuits making amends for their past have been in the news this year. First Georgetown University, founded by Jesuits, sought to make it up to the thousands of descendants of 272 slaves it owned and sold to safeguard the university's survival. Now the Jesuits of St. Francis Mission have announced they will return more than 500 acres to the Rosebud Indian Reservation in South Dakota. You have perhaps heard of, if not read, The Atlantic's June cover story by the late Alex Tizon, "My Family's Slave." The story is both tribute and confession: in it, Tizon describes his realization that the Filipina who spent her life caring for him and his family was, for all intents and purposes, enslaved by them. What, he asked himself, should he do with that information? How does he begin to make amends for an arrangement he did not put in place, but from which he benefited tremendously? There has been a flood of response to Tizon's article, and The Atlantic has followed up with two good ones, one by Ai-Jen Poo, a MacArthur "Genius" fellow, whose work centers on domestic workers' rights. And another by Vann Newkirk II, an Atlantic staff writer, which argues that liberation is a long-term process: "Enslaved people are not so much set free as they are made free..."
On our own podcast this week, Shereen and Gene talk to Alex Tizon's widow about how he felt about finally airing his thoughts about the woman he knew as Lola (the Tagalog word for grandmother); with a professor who studies modern-day enslavement about why even the word "slave" is problematic; and with a woman who said she experienced domestic enslavement for several years. It is riveting and uncomfortable, and worth the listen. And it's the beginning of a long weekend. Americans of all races, hues and beliefs fought and died so we wouldn't be enslaved by powers foreign or domestic. Take a moment to appreciate that. We'll be back next week.